Reviews, comments and feedback on television programmes featuring themes of interest to dinosaur fans and fossil collectors by Everything Dinosaur team members. The most iconic vertebrate in the fossil record, Tyrannosaurus rex has been given a makeover as part of a new television documentary programme due to be shown on the BBC. The hour-long documentary entitled “The Real T. rex with Chris Packham” is due to be shown on BBC Two on Tuesday, 2nd of January. According to the latest scientific research, this formidable Late Cretaceous predator may have looked very different from the way it is usually depicted in books, television programmes and on the big screen. A new illustration of T. rex (2018). Everything Dinosaur team members have known about the television documentary for several months, the aim of this programme is to update what T. rex might have looked like based on the very latest palaeontology, including studies of other feathered Theropods and the publishing of a scientific paper on the skin of Tyrannosaurus rex. The Tyrannosaurus rex makeover will not hold many surprises for dinosaur fans. Most of the information the programme divulges is not new, but for those viewers who think that the solitary, scaly hunter with a huge roar as in “Jurassic World”, is an accurate depiction, they are in for quite a shock. A new look for Tyrannosaurus rex (2018). This iconic dinosaur from the Hell Creek Formation of North America is depicted as having a sparse covering of bristle-like feathers, a scaly skin covered in dark blotches and brightly coloured, orange flashes directly above the eyes. Instead of a terrifying roar, this dinosaur was capable of producing a limited range of vocalisations, roaring is out, replaced by a virtually, inaudible low-frequency rumble, reminiscent of an elephant. Over the course of the programme, presenter Chris Packham discusses with various experts what T. rex probably looked like and how it might have behaved based on the latest fossil evidence. It is not that surprising, but the consensus of opinion is that Tyrannosaurus rex had more in common with birds than it does with today’s crocodiles. Not an astounding revelation given that T. rex was a lot more closely related to birds than to crocodilians. In the segment featuring Professor Julia Clarke (University of Texas), the skin colouration of this seven-tonne giant is discussed. Professor Clarke postulates that this animal was covered in dark patches. An analysis of fossilised dinosaur skin has identified structures similar to those that produce the natural pigment melanin. This suggests that T. rex could have been dark coloured and blotchy, perhaps to help break up its outline in dappled light, in a similar vein to the markings on some World War II battleships. The colouration of this dinosaur remains controversial, as the tendency to find structures that resemble melanin might reflect a bias in the fossilisation process. The absence of a total body covering of feathers in an adult animal is explained by the concept of the rate of heat loss based on the ratio between surface area and volume. A large animal in excess of thirteen metres long, such as Tyrannosaurus rex would have had a large volume compared to its surface area. It would have lost heat to its surroundings more slowly than smaller animals. Over-heating for an active predator could have been more of a problem rather than trying to keep warm, especially if T. rex was endothermic (warm-blooded). Hence, the lack of feathers on the body, a few stiff bristles and some tufts rather than a thick, shaggy coat. Younger animals with a larger surface areas compared to their volume, such as the sub-adult “Tristan” Tyrannosaur that features in the programme, may have had a more substantial coat helping to insulate the animal. The idea of a sparsely feathered T. rex has already been explored by model manufacturer CollectA. In 2018, they will be introducing a 1:40 scale replica of a Tyrannosaurus rex with fewer feathers than their current feathered T. rex model. In a direct comparison with modern flightless birds such as the Cassowary, the television documentary suggests that this dinosaur may have retained “a light patching of feathery bristles strategically placed for social display”. CollectA roaring feathered T. rex dinosaur model. Detailed scans of the fossil bones suggest that these dinosaurs might have fought with each other, perhaps over food, mates or even to decide hierarchies within packs or family groups. The bright orange crests over the eyes also portray T. rex with more affinities to the Aves. Birds have colour vision and rely on colour for visual displays. The scientists argue that the thickened ridges found on the skulls of adult animals may represent the remains of crests or prominent lumps that were very colourful and used to show maturity, dominance and perhaps played a role in ritual displays. Presenter Chris Packham comes face to face with T. rex. A television documentary exploring the life of a remarkable Ichthyosaur is due to be shown on BBC 1 on the evening of Sunday 7th January. Entitled “Attenborough and the Sea Dragon”, this hour-long programme follows the excavation of an Early Jurassic Ichthyosaur fossil on the Jurassic Coast of Dorset. Sir David Attenborough, a keen fossil hunter himself, joins a team of experts as they attempt to excavate the fossilised remains and piece together the life story of an ancient sea monster. A computer generated image of an Ichthyosaur. The fossilised remains, believed to represent the largest Ichthyosaur known from the British Isles, were discovered by Dorset fossil hunter Chris Moore in 2016. The documentary programme will include a segment in which the fossil bones are scanned and a replica skeleton of the 200 million-year-old “fish lizard” is created. By examining the bones, the team hope to bring this prehistoric sea creature’s story to life. Chris Moore with some of the blocks containing the Ichthyosaur fossils. Chris spotted the fossil material eroding out of a high cliff and the material had to be removed before the winter storms hit, otherwise the rare fossils would have been lost forever. The extraordinary fossil includes skin impressions, this leads to new revelations about how these predators might have looked. As the story unfolds, Sir David compares the sea dragon to animals alive today, including dolphins, sharks, crocodiles and turtles. As more of the fossil bones are revealed the scientists make a startling discovery. This Ichthyosaur did not die of natural causes, it was attacked, but what fearsome beast could have killed this giant? Using techniques more at home in a police forensics laboratory than a paleo-preparation lab, the team piece together evidence that points the figure of suspicion at another huge Ichthyosaur – a seven-metre-long monster called Temnodontosaurus. Detailed Ichthyosaur figure. Temnodontosaurus platyodon. Using state of the art imaging technology and cutting-edge CGI the team build the skeleton and create the most detailed animation of an Ichthyosaur ever made, bringing this Lyme Regis discovery to life as well as reconstructing its fate. The one-hour television documentary is confirmed for BBC One on Sunday 7th January 8pm to 9pm. It’s going to be well-worth watching. A television documentary focusing on how our perceptions regarding the most famous dinosaur of all has changed has been rescheduled and will now be broadcast on Tuesday, January 2nd. “The Real T. rex” presented by naturalist Chris Packham was due to be shown in late December, but this programme will now be shown on BBC 2 at 9pm on January 2nd. Chris Packham next to “Tristan” at the Museum für Naturkunde (Berlin). In the programme information sent to Everything Dinosaur by BBC Media, an outline of the format of the one-hour-long programme is provided. Chris embarks on a global journey to learn more about how scientists are reinterpreting Tyrannosaurus rex, a dinosaur which very probably, did not look like or sound like the animal portrayed in so many science fiction movies, including the new Jurassic World film (Fallen Kingdom), due to reach cinema screens in the summer of 2018. Ground-breaking research into the composition of dinosaur skin, teeth and musculature, combined with reconstructions of the brain of this super-sized Theropod, are helping to redefine this iconic dinosaur. Meeting numerous international dinosaur experts, the presenter aims to answer questions such as was T. rex a hunter or a scavenger? What colour was this dinosaur and just how much of this dinosaur’s body was covered in feathers? Was T. rex more bird-like than previously thought? Dinosaur model fans will already know that Everything Dinosaur exclusively revealed in a recent blog post that CollectA will be making a new deluxe. 1:40 scale feathered T. rex model, but this figure will have reduced plumage. Collectors should be able to pick up this figure around the middle of next year, shortly before the premier of “Fallen Kingdom”. Documentary viewers have been promised the most accurate CGI representation of a Tyrannosaurus rex ever created. Chris travels to meet Dr Greg Erikson, whose research with alligators is revealing the true power of this carnivore’s incredible bite. In Dino State Park (Texas), he walks in the footsteps of real and still visible dinosaur footprints and with the help of biomechanics expert Professor John Hutchinson and a virtual treadmill, they determine how the predator moved. 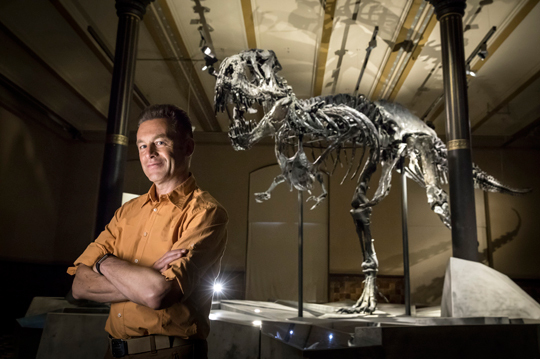 Chris Packham is given unique access to “Tristan” a star exhibit at the Museum für Naturkunde in Berlin. There is even an examination of the social life of T. rex, a section of this documentary in which Chris Packham explores the Badlands of Alberta in the company of renowned palaeontologist Phil Currie (University of Alberta). “The Real T. rex with Chris Packham” – Tuesday 2nd January, BBC 2 from 9pm to 10pm. Naturalist and broadcaster Chris Packham will be presenting a special one-hour documentary on the “King of the Tyrant Lizards”. Sources close to Everything Dinosaur expect this television programme to form part of the corporation’s Christmas 2017 schedule. Naturalist and broadcaster Chris Packham will narrate a documentary about T. rex. Life-long dinosaur fan Chris Packham once told Everything Dinosaur team members that one of the first things he made at school was a plasticine model of T. rex. His model with its kangaroo stance and tail dragging on the floor was based on pictures of Tyrannosaurus rex he had encountered in books. In the fifty years or so, since Chris made that model, our understanding of this iconic Late Cretaceous predator has been transformed. This sixty-minute, one-off television programme, aims to bring viewers up to date and combines state-of-the-art computer animation and the very latest research into one of the largest land carnivores known to science. A hunting T. rex. The latest dinosaur models show T. rex as a feathered dinosaur. In the programme, Chris embarks on a journey to expose the myths and misconceptions surrounding T. rex. He aims to separate the science from the often inaccurate portrayal of this dinosaur as seen in many movies. Viewers can expect further information about the running speed of this 7-tonne monster, it is unlikely there will be any scenes with a Tyrannosaur chasing down a jeep à la Jurassic Park. Taking inspiration from the “Tyrannosaur Chronicles – The Biology of the Tyrant Dinosaurs” by palaeontologist Dr David Hone (London University), the programme will explore the biology, diet, behaviour and anatomy of T. rex. Chris will meet numerous international experts and joins an excavation site in the Badlands of South Dakota to see how fossilised bones are excavated and prepared for study. 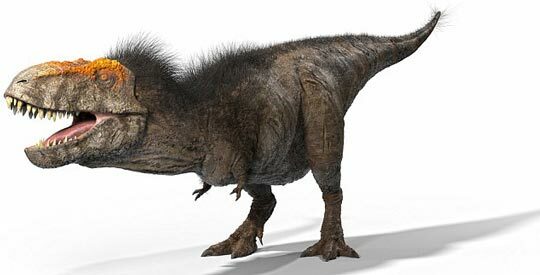 One of the aims of the production team will be to produce the most accurate CGI model of a T. rex created to date, that’s a long way from the plasticine figure from Chris Packham’s childhood. Expect to see plenty of feathers in what is being hailed as a trailblazing documentary blending the latest research from palaeontologists, ideas from zoologists and ground-breaking computer technology. To help put “flesh on the bones”, as it were, Chris will have access to Tristan (Tristan Otto), one of the most complete T. rex specimens ever found. Discovered in 2010 in the Hell Creek Formation (Montana), some 170 bones from a single individual have been collected. Tristan is housed in the vertebrate fossil collection of the Museum für Naturkunde (Berlin). It is the only actual fossil T. rex skeleton exhibit in Europe and a team of scientists are currently involved in an extensive research project to learn more about the life and times of this twelve-metre-long monster. “Tristan Otto” the T. rex specimen on display in Berlin. The documentary makers promise new information and insights into Tyrannosaur brain function and more details on those deadly, bone crushing jaws. Dinosaur fans in the UK can expect this documentary to light up their Christmas viewing, it will probably be available in other countries too, as broadcasting rights get sorted. “T. rex” for BBC2 is a co-production between Talesmith and Cineflix. The Executive Producer is Martin Williams and the BBC Commissioning Editor is Diene Petterle. “Attenborough and the Giant Dinosaur”! Exciting news for dinosaur fans of all ages. The BBC has ended the embargo on a new documentary programme outlining the discovery and study of over two hundred giant dinosaur bones found in Argentina. The fossils represent a new species of enormous long-necked dinosaur (Titanosaur) and when finally named and scientifically described, this could be the largest dinosaur known to science, surpassing the likes of Argentinosaurus (A. huinculensis) and Futalognkosaurus dukei, fossils of which also come from Argentina. Potentially the biggest terrestrial animal known to science. The picture above provides a sense of scale for the huge animal, Sir David Attenborough is lying next to right femur (thigh bone) which measures 2.4 metres long. This is the largest thigh bone ever found from a terrestrial animal. Femora circumference data suggests a body mass in excess of seventy tonnes. The television programme will be shown on BBC1 at 6.30pm on Sunday, 24th January. It tells the story of how the fossils (over 220 of them have been excavated and catalogued), were found and follows the scientific research from excavation, preparation and cleaning right up to the unveiling of a life-sized model of the new type of Titanosaur. With such a large number of bones to examine, the scientists have been able to build up quite a detailed picture of this dinosaur. The fossilised bones represent a total of seven individual dinosaurs, the largest of which was the one that the Canadian and Argentinian team of model makers based their reconstruction on. To conclude the programme, Sir David will unveil the new reconstruction of this enormous herbivore. The model measures 37 metres long, that’s almost the equivalent of tacking the playing surface of Wimbledon’s Centre Court onto the length of a basketball court. For comparison, “Dippy” the Diplodocus replica housed at the Natural History Museum (London), is only 26 metres long. The reconstruction of Argentinosaurus huinculensis, housed in the Museo Municipal Carmen Funes, Plaza Huincul (Neuquén Province, Argentina) is around 35 metres in length. The largest dinosaur yet described, but under threat. The date when this animal roamed differs in the press release from that stated earlier when Everything Dinosaur first published details of the fossil discovery. The BBC press release suggests that this giant dinosaur roamed around 101 million years ago, whilst our data suggests that it lived slightly later, around 95 million years ago (Cenomanian faunal stage of the Cretaceous). The heart of this huge beast would have weighed something like 200 kilogrammes and with a circumference estimated at two metres it would have pumped ninety litres of blood round the body with one huge beat. That’s more liquid than the average amount of water that people have a bath in. “Attenborough and the Giant Dinosaur” will broadcast on BBC1 on Sunday 24 January at 6.30pm. It will be available on the BBC catch up services and we at Everything Dinosaur are eagerly looking forward to watching the programme. That is a very big thigh bone! The second part of Maverick TV’s “Dinosaur Britain” aired on terrestrial television last night (ITV1). Once again, presenter Ellie Harrison was joined by palaeontologist and author Dean Lomax on an exploration of Britain’s dinosaur fauna. However, unlike the first programme with its emphasis very much on English dinosaurs, the two, intrepid investigators travelled into Scotland and Wales to help reveal some of the ancient animals that roamed these parts of the British Isles. Plucky Ellie, who had coped with a very claustrophobic slate mine in programme one, was tasked with manning a row boat on Loch Ness. No Nessie to be seen, but an opportunity to introduce the idea that whilst dinosaurs dominated terrestrial habitats during the Mesozoic, the seas surrounding the land masses that were ultimately to become Britain, once teemed with marine reptiles such as Plesiosaurs. This had been touched upon in the first part of this two-part documentary series, when the idea of Ichthyosaurs feeding on the carcases of drowned armoured dinosaurs was discussed and it was good to see the storyline brought up to the present when on the beach at Lyme Regis, the presenters were shown Ichthyosaur vertebrae and a small bone, potentially from an Early Jurassic Plesiosaur. If the objective of the television programmes was to demonstrate the diversity of British Dinosauria and to encourage people to try fossil hunting for themselves, then appetites were certainly whetted when some of the children’s fossil finds were shown, Ellie Harrison seemed genuinely excited to have found some Belemnite guards. Back to the dinosaurs and viewers were treated to a view of a Sauropod wandering around Edinburgh, part of a segment that explained the importance of the Isle of Skye in terms of its contribution to our understanding of the dinosaurs of the Jurassic. Steve Brusatte, (University of Edinburgh) enthusiastically introduced more dinosaur fossils from the British Isles. Steve is an American and we teased him last night when tweeting about seeing him discussing dinosaurs from this side of the Atlantic, when it is usually the dinosaurs known from the United States that tend to grab all the attention. Steve took our gentle teasing in good spirit and he reminded us that it is because of British dinos that Steve has such a fantastic job! On the Isle of Skye, Dean explained to Ellie that the tri-dactyl footprint he had located on the beach was very much a case of “walking with dinosaurs” and this led to a viewing of a tiny dinosaur footprint, less than two centimetres in diameter. The fossilised print was discovered in Score Bay (Isle of Skye) and is thought to be the smallest dinosaur footprint ever found in Europe. Slightly bigger prints were revealed on a visit to a beach on the southern side of the Isle of Wight. These tracks were made by Iguanodonts, we suspect that the ones shown were examples of the natural casts from the foreshore of Hanover Point. Cue an opportunity to introduce all-round good guy Darren Naish (vertebrate palaeontologist and science writer), who outlined some of the pathology found on the fossilised bones of the huge predator Neovenator and this dinosaur’s potential prey the Ornithopod Mantellisaurus atherfieldensis. The resulting CGI showed the Neovenator accumulating all its injuries in just a few seconds as it pursued its victim, a little unlikely, but the important message here for the viewer, so eloquently relayed by Darren, is that the fossilised remains of long extinct animals can provide scientists with an insight into potential predator/prey interactions. Forensic examination of dinosaur bones can help to tell the story of the lives of long extinct animals. The picture above shows two fossil back bones (dorsal vertebrae) from the Ornithopod Mantellisaurus found in association with the Theropod Neovenator (N. salerii). The bone on the left shows normal morphology with a tall, rectangular shaped neural spine. The bone on the right shows a traumatic injury on the neural spine (see inset). Bone re-growth in the area indicates that this iguanodontid lived for some time after this injury. These pictures come from the excellent “Dinosaurs of the British Isles” book written by Dean Lomax and Nobumichi Tamura. This book provides a comprehensive overview of the dinosaurs of the entire British Isles and is highly recommended. Programme two – features Cetiosaurus, Proceratosaurus, Iguanodontids, Stegosaurs, Neovenator and even little Echinodon is depicted. Just one small point that was noted by a colleague, many of the measurements provided for the dinosaurs were given in feet. Old timers like the staff at Everything Dinosaur are well used to this, but with this programme aimed at a family audience including children, would very young viewers appreciate the size and scale of these prehistoric beasties when imperial measurements were used in some cases? Perhaps not, although the CGI showing the armoured Dacentrurus wandering the galleries of the Natural History Museum and the tiny Echinodon attacking a sandwich at least gave viewers an opportunity to gauge size for themselves. Time to introduce one of the earliest members of the Tyrannosauroidea clade, Proceratosaurus a very distant relative of the famous Tyrannosaurus rex. Ms Harrison was surprised to learn that this three metre long Theropod once roamed around her home county of Gloucestershire. To conclude the second programme, the viewer was brought right up to date and introduced to the very latest dinosaur to be added to the compendium of British dinosaurs. Found in Lower Jurassic rocks at Lavernock Point (Vale of Glamorgan, Wales), Dr. Dave Martill (University of Portsmouth), showed off a remarkable fossil discovery, the partial skeleton of a small, agile meat-eating dinosaur that might turn out to be the oldest dinosaur specimen ever found in Jurassic aged strata. It was pleasing to see plenty of feathered Theropods throughout the two programmes. It seems that there are more dinosaurs awaiting discovery in the rocks of the British Isles. Thanks to Maverick TV the British public has gained an appreciation of our rich dinosaur heritage. A quick nod to the schedulers, the earlier start time of 8pm would have been appreciated by mums and dads. Showing the programme an hour earlier than the first episode would have permitted more children to stay up and watch. The Oxford University Museum of Natural History might not be the same again after one of its most famous items in the collection, the Megalosaurus bucklandii came to life and pursued a cyclist down the high street. Just one of the scenarios acted out tonight in the very informative “Dinosaur Britain” which was aired on ITV1 this evening. This was the first part in a two-part documentary made by Maverick TV which sets out to explore the rich dinosaur heritage of the British Isles. Bringing British dinosaurs to life! Aimed very much at a family audience, the first programme sees presenter Ellie Harrison going on a tour of the United Kingdom to learn about some of the amazing dinosaurs that once roamed this part of the world. Even today, we at Everything Dinosaur estimate that, one in twenty of all the dinosaurs known to science is represented by fossils found in the British Isles, that’s about one hundred different species and what an eclectic bunch they are. Ellie is guided on her tour of Britain’s dinosaurs by our chum Dean Lomax, a palaeontologist who has recently written an excellent book entitled “Dinosaurs of the British Isles”, so he is ably qualified to assist Ms Harrison on her quest to learn about these amazing reptiles. After a close encounter with Baryonyx in the Natural History Museum, Ellie meets up with a Megalosaurus, which does look a little out of place scavenging a council bin for a quick snack. After all, Oxfordshire has changed quite a bit in the 167 million years ago since Megalosaurus was around. A new hazard for cyclists around the Oxford area. Then it’s to South London to view the Crystal Palace dinosaur sculptures and to hand feed an Iguanodon, the CGI permitting viewers to see for themselves how our interpretations of the Dinosauria have changed since the time of the Great Exhibition. Britain’s own “raptor” Nuthetes destructor, the name means “destroyer monitor”, makes an appearance, strangely enough at Stonehenge, although the fossils were found on the Isle of Purbeck (Dorset), cue more running for Dean and Ellie. Good to see feathers on our turkey-sized dromaeosaurids. Perhaps, for us the best part of the programme concerned the Early Jurassic armoured dinosaur Scelidosaurus. The fossil specimen, part of the Bristol Museum and Art Gallery collection is truly remarkable and who better to talk to about it than David Sole, the Dorset fossil collector who discovered the fossils back in 2000. Professor Mike Benton is our guide at the Bristol Museum, he explains how this beautiful dinosaur fossil came to be preserved in such an amazing articulated state. Claim to fame for Everything Dinosaur, we supply the Scelidosaurus models for the Museum’s shop. A model of a Scelidosaurus. The programme blended dinosaur facts and entertainment quite well in our opinion. The focus for part one was very much on English dinosaurs, expect other parts of the British Isles to get more of a look in with the second programme which is scheduled to be shown tomorrow at 8pm. Our congratulations to the programme makers, it is good to see that “British dinosaurs” are getting a share of the limelight. When asked to think about dinosaurs, most people might imagine scientists searching for giant bones and teeth in the more remote parts of the world, places like the intriguingly named “Hell Creek” of Montana or the “Badlands” of South Dakota. What might surprise most members of the public, is, that once upon a time, dinosaurs roamed over the British Isles. Not only that but dear old “blighty”, plus Wales and Scotland, can lay claim to having one of the best dinosaur fossil records of anywhere in the world. Putting British dinosaur discoveries in the spotlight is the aim of a new, two-part television documentary that is being shown on ITV1 next week. Presenter Ellie Harrison accompanies palaeontologist Dean Lomax on a whistle stop tour of dinosaurs of the British Isles and thanks to some super-duper CGI, viewers will be able to see some examples of these amazing prehistoric animals wandering around the UK. Presenter Ellie Harrison confronts a Theropod dinosaur. The first part of this documentary, “Dinosaur Britain” created by production company Maverick TV, will be shown on Bank Holiday Monday, 31st August at 9pm. In this episode, Ellie, who confesses to having an interest in dinosaurs ever since she first heard about them as a child, explores the very first scientifically described dinosaur (Megalosaurus) as well as learning all about the fearsome Baryonyx, whose fossils were found in a Surrey clay pit. Helping Ellie to piece together the clues about Britain’s ancient past is talented palaeontologist and British dinosaur aficionado, Dean Lomax. Dean explains what fossils can tell scientists about prehistory and accompanies the naturalist and journalist on a journey around the British Isles exploring the country’s amazing dinosaur heritage. Dean guides Ellie through a dinosaur dominated Britain. Brave Ellie is likely to get chased by a few of the more dangerous dinosaurs to have once roamed our countryside, and we expect the camera crew to entice her into hand-feeding the occasional iguanodontid or two, but this documentary will also inform viewers about some members of the Dinosauria, whose fossils are unique to Britain. For example, travel to the beautiful Dorset coast and visit the location where amateur fossil hunter David Sole discovered the remarkable fossilised bones of one of the first armoured dinosaurs. The dinosaur discovered by David, now resides in Bristol Museum, it is a Scelidosaurus and there is no record of it being found anywhere else in the world, it’s the “Jurassic Coasts” very own dinosaur. Part two of “Dinosaur Britain” is due to be shown on the following evening (8pm ITV1). The intrepid duo travel to the Isle of Skye to learn about some of the biggest terrestrial animals ever to roam Europe. Some of the giant, herbivorous Sauropods that thundered across our ancient landscape were as long as two London buses. Dean explains to Ellie how dinosaur footprints are important trace fossils, fossils which actually show behaviour of long extinct creatures. Ellie Harrison says hello to a Sauropod. A comprehensive guide to British dinosaurs over 400 pages. Concluding their journey through 160 million years of British history, the documentary ends with a visit to Cardiff to view one of the most recently discovered dinosaurs. There were once real dragons in Wales, albeit little ones but the fossils of a Theropod dinosaur discovered by brothers Nick and Rob Hanigan might turn out to represent the earliest dinosaur known from Jurassic aged rocks. Everything Dinosaur produced a short article announcing this discovery including pictures of the fossilised bones back in June. Looks like, thanks to Ellie Harrison and Dean Lomax (plus Darren Naish et al), British dinosaurs are going to be well and truly put on the map! By now it could not possibly have escaped your notice that “Jurassic World”, the fourth in the “Jurassic Park” movie franchise opens next month (June 12th). Another teaser trailer has just been put out and the film is certainly one of the most eagerly awaited cinema events of this year. However, you don’t have to visit Isla Nublar to view dinosaurs, travel back in time and “dear old blighty” was home to a huge range of prehistoric animals including three types of Tyrannosaurs*. The very first scientific descriptions of dinosaurs in the early to mid 19th Century were all based upon fossil discoveries made in the UK. To mark the United Kingdom’s contribution to this sub-division of vertebrate palaeontology, ITV has commissioned the production company Maverick Television to transport Britain back to the Mesozoic to depict how this part of the world was once home to a myriad of prehistoric animals. Different dinosaurs and approximate locations. Over one hundred different species of dinosaur have been identified so far from fossils found in the British Isles. This includes those three Tyrannosaurs as mentioned above* [Eotyrannus lengi (Isle of Wight), Proceratosaurus bradleyi (Gloucestershire) and Juratyrant langhami (Dorset)]. Back in 2014, Everything Dinosaur reported on the first formal survey of British dinosaurs undertaken by a group of scientists, which included the very talented Darren Naish, a vertebrate palaeontologist from the University of Portsmouth. In August of last year, we reviewed the excellent “Dinosaurs of the British Isles”. This book provided a comprehensive guide to the different types of Dinosauria that once roamed around Britain. Not entirely accurate as for much of the Mesozoic, this part of the world was underwater and when dry land did occur in the past, it formed part of a much larger continental landmass, but that’s not the point, for the last eight thousand years or so, Britain has been an island and there is a wealth of dinosaur and other prehistoric animal fossils to be found in the British Isles, so much so, that it has inspired the commissioning of a new two-part television documentary series. ITV has commissioned Maverick Television (creators of programmes such as “Embarrassing Bodies” and television make-over shows such as “How to Look Good Naked”), to make two, one-hour long documentaries examining the types of different dinosaur that existed in the British Isles. Everything Dinosaur understands that the working title for this series is “Dinosaur Britain” and CGI techniques will be used to place ancient creatures in modern-day settings. So if you fancy seeing an Iguanodont wandering around Kent or a Megalosaurus taking a stroll through the centre of Oxford then this new television series might just float your boat! Director of Factual Output for ITV, Richard Klein has ordered the programmes which will attempt to educate viewers not only on the types of dinosaur that once existed in the UK, but also to provide information about the habitats and ecosystems of the UK during the Age of the Dinosaurs. Dinosaur fans can expect lots of hunting and fighting sequences too. At the time of writing we are not sure when these programmes will be shown, but one thing is for sure, with all the hyperbole surrounding “Jurassic World”, we can expect dinosaurs to have a much bigger media footprint (even bigger than usual), over the next couple of years. For those of us in the United Kingdom, look out for David Attenborough’s new television series which starts on Friday 20th September and is being shown on BBC 2 (9pm). This two-part documentary series which has the same format as the 2011 documentary series called “David Attenborough’s First Life” takes viewers through the evolution of the vertebrates. The evolution of animals with backbones is one of the greatest stories in natural history. Brand-new discoveries of fossils, including some amazing fossil discoveries from China, combined with stunning CGI and cinematography enable Sir David to tell this fascinating story and reveal that humans (Homo sapiens) are just part of an amazing lineage of animals that dates back some 500 million years or so. In the first episode, entitled “From The Seas To The Skies”, David Attenborough uses new fossil evidence to unlock nature’s most extraordinary story, the incredible ascent of the animal group that now dominates our planet, the vertebrates. The origins of the vertebrates lie in primitive fish that once swam in ancient seas but remarkable advances allowed them to make the radical move onto land, and then take to the skies with the advent of flight. Sir David tells the story of the vertebrates. Team members at Everything Dinosaur have rated this series ten out of ten, we highly recommend watching either on the television or via other channels such as online. Everything Dinosaur acknowledges the help of BBC Media Centre for the compilation of this article.